WASHINGTON — A law firm tied to former Trump campaign chairman Paul Manafort’s Ukrainian consulting work has agreed to pay more than $4.6 million and register as a foreign agent, the Justice Department said Thursday. The civil settlement with the law firm of Skadden, Arps, Slate, Meagher & Flom LLP brings to a close at least one part of a probe that spawned from special counsel Robert Mueller’s Russia investigation. Mueller’s team has delved deeply into Manafort’s years of work in the eastern European country as they investigated possible coordination between Trump associates and Russian interference in the 2016 election. 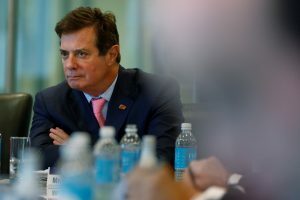 The Manafort part of Mueller’s probe — which yielded two indictments, a trial conviction and ultimately Manafort’s guilty plea — also entangled several prominent law or lobbying firms, including Skadden, because of their involvement in foreign lobbying or public relations work that the former Trump campaign chairman sought to conceal from the U.S. government. The Skadden settlement says that in 2012 the law firm acted as an agent of the government of Ukraine as part of that work but, because of an unnamed partner’s “false and misleading” statements, failed to register with the U.S. government under the Foreign Agents Registration Act, or FARA. The law firm will now have to register with the U.S. government as the foreign agent for the work and pay the $4.6 million fine, which equals the proceeds of the Ukrainian work. The announcement comes months after Mueller referred to federal prosecutors in Manhattan an investigation into Skadden attorney Greg Craig, a former White House counsel in the Obama administration who has since left the firm. Craig was the author of the report at the center of the settlement announced Thursday, which sought to prop up the legitimacy of the Ukrainian government’s prosecution of former Prime Minister Yulia Tymoshenko. Lawyers for Craig did not respond to phone calls seeking comment. The New York-based probe has also scrutinized two prominent Washington lobbying firms to determine whether they had knowingly violated FARA as part of their work for Manafort. Prosecutors in recent months have questioned witnesses knowledgeable of work performed by the two firms, the Podesta Group and Mercury Public Affairs, which have denied any wrongdoing.